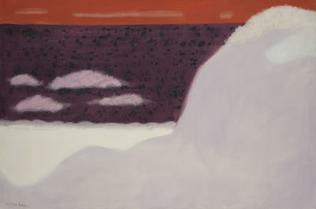 Born in Sand Bank, New York, in 1885, Milton Avery relocated to Hartford, Connecticut in 1898 with his family. After having numerous different jobs and working in countless factories, Avery saved enough money to paint fulltime. Although Avery’s art was then conservative, he maintained a strong emphasis on color. After marrying Sally Michel in 1924, the couple settled in New York City. At this time the influences of Matisse and Picasso are evident in his work. While Avery continued to paint traditional themes throughout his life, he always experimented with color and abstraction. By the mid-1940s, his style focused largely on the flattened shapes, the absence of details, and the reduction of subjects to their basic forms.